Nevada friends Darryl & Gary are spending a couple of days with me. today we went to the one in New Mexico. we walkd around the once glorious Castaneda Hotel lunchd at Landmark Grill in the still-being-refurbishd Plaza Hotel put our hands in Montezuma Hot Springs. Gary bought a Polly Whitcomb pot on Bridge St & I bought Mamie Van Doren's autobiography at an antique shop. to wake to hear 2 cities in which I've lived on the national news. 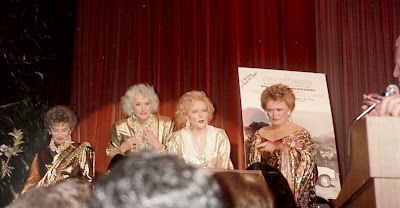 I took this of her with the other Golden Girls at the party following Nite of 100 Stars in 1990. unfortunately I have no photos of her when we brought her to Santa Fe in 1999 for "Live at the Opera." ironically I learnd of the deaths of Cooper & Arthur on the same day. Bea creatd the role of Vera Charles in the musical "Mame." later in the run Marilyn took over the role of Gooch. she was one of my favorite Broadway performers. 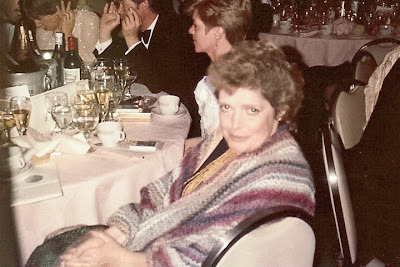 I took this at the 1984 Tony Awards ball. to see more work by this superb artist see his You Tube page. for my birthday cousin Sal sent me this photo which I've never seen before. I think I was 3. it was taken in Lorain. 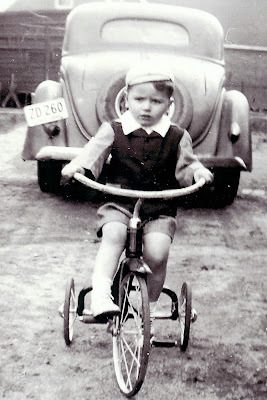 not sure which is spiffier -- my outfit or the tricycle. I close my eyes & am in places past. the hammock in the backyard in Elyria. a hillside on front campus in Kent. an egg-shaped pool in Hollywood. I smell those places. places where I was so alive. the beauty of those places is so keen that I know none of them were ordinary. the sun of this moment overlaps that of those. I am the intersection of past & present. I am alive & intoxicatd by so much beauty. that's the last line in Thrity Umrigar's 1998 column on the death of Fran Murphey. & Fran did. CNN is reporting that a postcard she maild in 1962 just arrivd. long before I met her I heard abt Fran Murphey. I was an undergrad in Kent State University's school of journalism. & she was one of the school's best-known grads. the year I was born she went to work for the Akron Beacon Journal. she was both reporter & photographer. a large woman with plain looks she often wore pants. she spoke her mind. & she always got her story. I'd see her sometimes hanging around the faculty offices on campus (she knew everybody) & years later at various Akron functions (she never missd an important event). & when it came time that she mentiond me in her column it was a joy because it made me feel part of the history of the Akron-Kent community. Fran Murphey's sudden appearance in the national news so long after her death is exactly the kind of story she wd've written so well. why doesn't he follow the lead of the Freddie Mac CEO? is how the news is making me feel. I'm trying hard not to rebut the last administration's bien-pensant veep or snarl at that beauty queen or wonder what the Texas secessionists eat for breakfast. going thru files the other day I came across a strip of portraits of her. 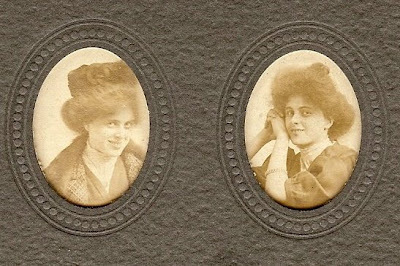 they were taken at Brinkmier's Studio in Pittsburgh perhaps in the 1880s. she signd the back which also has this addendum in her hand: "Taken when I attended a Dramatic School." & dramatic she remaind. 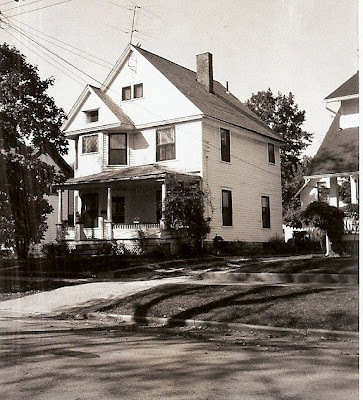 when Mother & I wd visit her in the old house at 225 East Broad she was an elderly widow but had a lively wit to match an expanse of henna hair. for some time now Gertrude's chair has been a part of my life. I like when one person's history becomes a part of another's. Jean-Claude van Itallie took this picture 40 years ago. 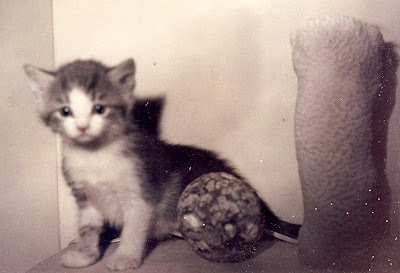 it was the photographic debut of a kitten I'd name Moore because he was born in Jean-Claude's NYC apartment next door to Marianne Moore's. that summer I went to Jean-Claude's farmhouse in the Berkshires to fetch the cat. in those days one cd bring abt anything on a plane. so I carried him on board in a case & put him under my seat. he lived with me in Twin Lakes & joind me for the move into town in 1980. Moore died in mar 1982. 3 months later I again went to Jean-Claude's farm to retrieve another cat. this one was calld Tobias & eventually traveld with me from Ohio to New Mexico. he's buried in the backyard. good wishes to Brent Goodman who had a heart attack. 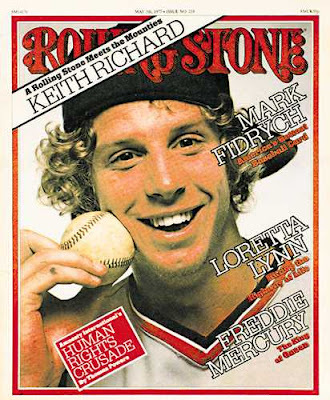 in Paul Metcalf's "The Players" Fidrych joins Walt Whitman on stage. 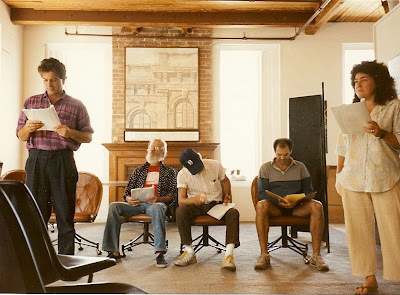 I took this picture during rehearsal for the 1986 premiere of the play. artist Julio Grande playd Fidrych. also on stage were Michael Gizzi Richard L. Robbins David Raffeld Cheryl Nelsen. not sure how long this will stay up. this Daily Motion posting of Susan Boyle has over 2 & a half million hits. altho I can't seem to get the Susan Boyle link to work here I have put the video up on my Facebook page. I'm a sucker for the formula in which someone who has been bullied or dismissd trimuphs. altho I don't like the myriad of talent shows on tv these days a friend told me abt a You Tube video ( http://www.youtube.com/watch?v=9lp0IWv8QZY )from a show calld "Britain's Got Talent." For some reason You Tube no longer allows it to be embedded & I can't get the link to work but do make the effort to look. "I was born with a disability and that made me a target for bullies. I was called names because of my fuzzy hair and because I struggled in class. I told the teachers, but because it was more verbal than physical I could never prove anything. But words often hurt more than cuts and bruises and the scars are still there. I still see the kids I went to school with because we all live in the same area. They're all grown up with children of their own. But look at me now - I've got the last laugh...Mum loved the show and used to tell me I should put my name down and that I'd win it if I did. But I never thought I was good enough. It was only after she died that I plucked up the courage to enter. It was a very dark time and I suffered depression and anxiety. But out of the darkness came light. I realised I wanted to make her proud of me and the only way to do that was to take the risk and enter the show." I keep watching this video again & again -- now mostly to observe that look of satisfaction on this woman's face. as Rita & I made our way to Easter brunch. someone who grew up in my hometown of Elyria has sent me a couple of e's today. in one he mentions the house where Sherwood Anderson lived. the novelist & his family moved into this house in 1908. I took this polaroid in 1967 for an article I had written. I presume the house still exists. they first lived in a brick apartment building called The Gray which I remember showing David Meredith a few years ago. this has been a retrospective day. 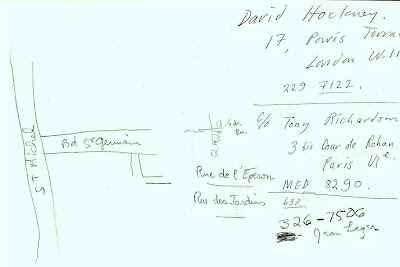 David Hockney drew this in my travel journal on my 1st trip to Europe. I'm undergoing quite an adventure with Tom Beckett. he's tough & I'm cranky. so this is a bit of a challenge for each of us. even tho the Doris movie I saw ce soir wasn't one of her best she's always a joy to watch. to read what Steve Tills has to say abt It's All a Movie. thx Bree . 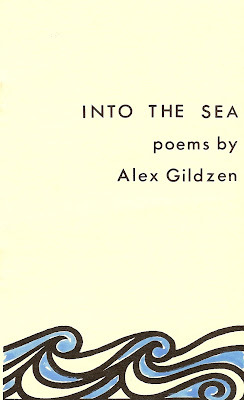 . .
there are only 3 poems in this little book which was publishd in an edition of 200 copies by Abraxas Press. there are 2 states to the cover. some are black ink on manilla card stock. others have blue added to the wave design (as above). original price was a quarter.